New Boston’s Peyton Helphinstine plants her foot as the senior begins her swing. New Boston’s Taylen Hickman winds up to throw a pitch. Green’s Kerston Sparks begins to go around with the bat. Green’s Ava Jenkins steps into her swing on Thursday evening. New Boston’s Morgan Rawlins stands in at the plate. FRANKLIN FURNACE — When a unit breaks through and performs to its maximum level from all standpoints, the results can be fruitful — and fun to watch. On Thursday evening, the New Boston Tigers’ softball program experienced that very feeling as Brian Holbrook’s club, behind two hits apiece from Morgan Rawlins and Tasha Poole, five RBI combined from the pair, and a six-inning, six-hit performance in the circle from Taylen Hickman, walked away with a 9-4 victory over the Green Bobcats’ softball program on Thursday evening in Franklin Furnace. For Holbrook, the third-year head coach couldn’t ask for anything more. As for Shane Jenkins, Green’s second-year head coach believes that a lack of game reps — due to the inclement weather that has occurred throughout much of the regular season — came back to bite the Lady ‘Cats in Thursday’s affair. From the start, New Boston proved to be in control as the Lady Tigers struck with two-out magic to begin the affair. With one down, Kaylee Stone singled to left to begin the top half of the first, and two batters later, Peyton Helphinstine followed with an RBI triple to the gap in right center field to score Stone easily. Sammy Oiler then followed with an RBI single that dropped in shallow right field, which allowed Helphinstine to score as the Lady Tigers took a 2-0 lead after an inning of play. Stone and Helphinstine, who each went 1-for-2 against Clay on Wednesday, continued their strong approaches on Thursday as Stone went 2-for-5 with a double and a run scored while Helphinstine’s RBI triple ultimately spearheaded the senior to a 2-for-4 day with two runs scored. Stone added a strong final inning in the circle to wrap up the victory. In the bottom half of the third frame, Green got on the scoreboard with some two-out magic of their own. A single by Megan Johnson and a passed ball allowed leadoff hitter Ava Jenkins to bring in Johnson with her single to left to cut the deficit in half, 2-1, after two innings of work. However, the margin proved to be as close as the Lady ‘Cats would get to the point. In the top half of the fourth inning, Sammy Oiler added a leadoff single and Lexus Oiler followed with a walk to put runners on first and second. Poole then followed with a one-out base knock to left field, and two batters later, Rawlins added an RBI single to plate Poole as New Boston opened the gap up to a 4-1 advantage after four innings of work. While New Boston opened its lead back up at the plate, Hickman wasted no time going to work in the circle. 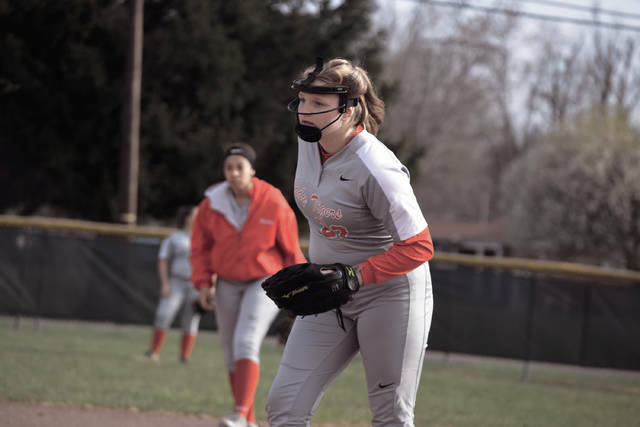 In addition to only allowing six hits in her six innings of work, the sophomore had the punchouts working as the senior also struck out six batters through her aforementioned time in the circle. In the third, fifth, and sixth innings, the athletic and promising underclassman stymied what would’ve otherwise been bigger frames from Green by scoring a punchout to end each inning with runners on base. In the top of the fifth inning, New Boston opened the lead up further. After Helphinstine beat out a throw from the left corner of the infield to record a single, Sammy Oiler followed with another base knock and Lexus Oiler drew another walk to load the bases. 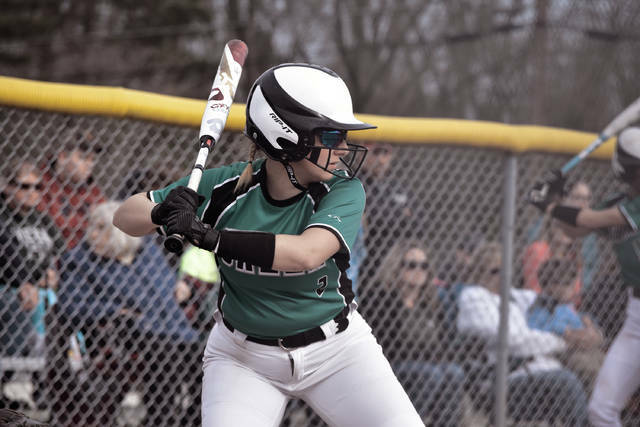 Poole, Brooklyn Hoskins, and Rawlins then added back-to-back-to-back RBI base hits — with the latter drawing home a pair — to increase the lead, and an infield error allowed Poole to come in as New Boston took a 9-1 advantage. 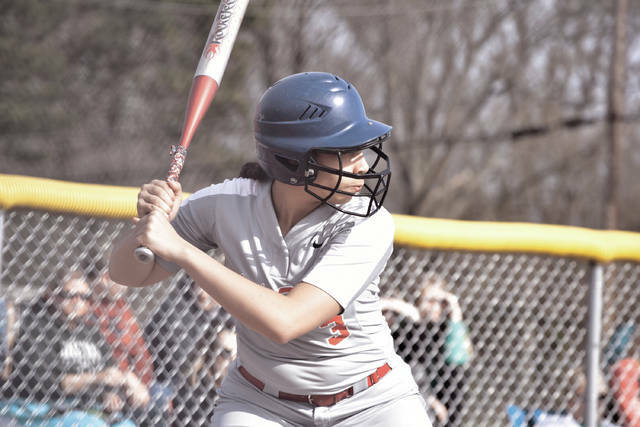 In the middle pair of stanzas, Poole and Rawlins helped spearhead the New Boston attack by going 2-for-4 with the former driving in and scoring a pair of runs and the latter adding a 2-for-4 day on her on while walking and driving in three RBI. Sammy Oiler added a 3-for-4 day at the plate and drove in a pair of runs while scoring twice to add to the strong seven-run output between the middle frames. 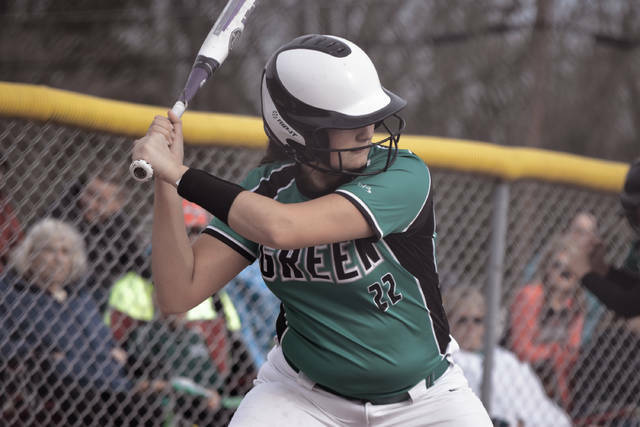 In the bottom of the fifth and sixth innings, Green got a much-needed spark from one of their elder statesmen in Kerston Sparks, who delivered an RBI double to the right center field gap to score Kori Derifield in the fifth inning and notched a two-RBI single to right field to score Mac Carver and Hailey Hammonds in the sixth, with Derifield, Carver, and Hammonds setting the table with a pair of singles and a walk, respectively. While the Lady ‘Cats weren’t able to come any closer than the 9-4 margin, Sparks’ 2-for-3 day, which included a double and three RBI, was a promising sign from Jenkins’ standpoint. 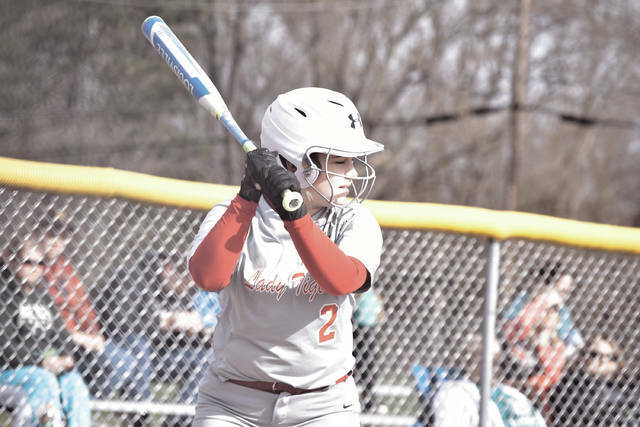 With the victory, New Boston will look to gather momentum as a break in the weather — following two expected rain-to-snow storm systems from Saturday to Monday — has Holbrook, and the Lady Tigers, ready to play softball. As for Green, the Lady ‘Cats are looking forward to the same scenario — because it will allow Green to shake off the rust that has occurred from the various weather systems that have made a rude entrance to the Tri-State Area over the past few weeks.